Masahiro Shinoda directed Pale Flower in 1964 for the prestigious Shochiku film studio. Shinoda’s remarkable film was part of the 1960s Japanese New Wave cinema and the film’s iconoclastic temperament led to it being banned. In 2003 Home Vision Entertainment released Pale Flower on DVD whilst this year Criterion issued their version on both DVD and Blu-ray. I’ve not come across Shinoda’s work before and my encounters with Japanese cinema have tended to favour popular auteurs. I’m beginning to realise the vastness of Japanese cinema in terms of output stands alone in many ways when compared to other film industries. Shinoda’s loose, elliptical approach and dynamic visual style bears close parallels with the work of Seijun Suzuki. 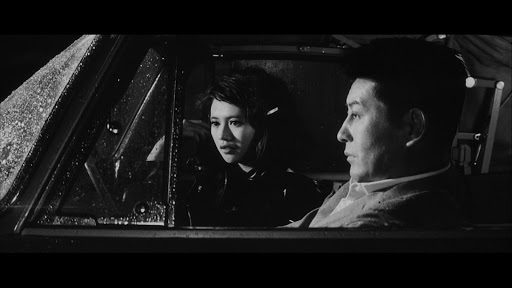 Pale Flower would work superbly as a double bill alongside Suzuki’s demented Branded to Kill. In many ways, the initial narrative set up of Pale Flower in which a hardened Yakuza gangster Muraki (Ryo Ikebe) is released from prison, having killed another member of a gang, invokes the memory of American crime and noir films. It is a familiar convention – the gangster or criminal who is released from prison but realises he cannot fit into society anymore and slowly becomes more and more withdrawn. Whilst Shinoda adopts this narrative convention, he decides to choose an entirely different path altogether for his central male protagonist. On his release, Muraki seems more bored than alienated with the world around him. It is Muraki’s entanglement with a mysterious young woman Saeko that subverts such a narrative expectation because it becomes a mutually destructive relationship. Symbolically, the woman’s addiction to drugs/gambling represents both the corruption of Japanese youth and the rise of a new kind of modernity whilst Muraki’s allegiance to a code is ideologically conducive of an old, fading Japanese culture. In many ways, Muraki is like the antiquated cowboy who looks out of place in the new society and for Muraki the retreat to the sanctity of the prison gives him seclusion from a world that has little meaning for him anymore. Visually, Shinoda’s film is stunning to look at and the striking monochrome cinematography gives the imagery a very clean yet noir like aesthetic. The performances by Ryo Ikebe and Mariko Kaga are compelling throughout. A film like Pale Flower was a direct manifestation of the changing sensibilities in Japanese cinema during the 1960s but unlike The French New Wave which challenged dominant mainstream conventions, from the outset The Japanese New Wave seemed more ideologically engaged. It was only much later that The French New Wave became much more of a political cinematic entity. 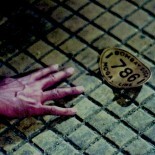 Nevertheless, compared to Nagisa Oshima, Shinoda’s cinema was less political than his contemporaries and there is no denying that Pale Flower has been influential in the development of the Yakuzka gangster film in Japanese cinema. Director Masahiro Shinoda produced most of his best and most acclaimed films during the 1960s. This entry was posted on August 21, 2011 by Omar Ahmed in 1960s World Cinema, Crime, Criterion, Japanese Cinema, Japanese New Wave, Noir, Yakuza.